Elias Canetti was walking along the banks of the Danube when he spotted a large rectangular object in the middle of the road. As he got closer to inspect it he realized it was a train wagon, eerily parked on the train tracks, full of people. He asked his companion about it. “Refugees” he said – consciously avoiding the term “Jews”. The scene is narrated in The Discovery of Evil, a chapter in Canetti’s autobiography. As a Sephardic Jew who resided in Vienna before the Second World War, Canetti experienced first-handedly the impact of displacement and the rise of xenophobia and hate in the belly of Europe. A hundred-years later a similar drama is being played out in the same spot. Last year, thousands of refugees escaping turmoil in the Middle East made their way through Vienna after Hungary expelled them from Budapest’ main train station. The crisis reached a breaking point when 50 migrants were found dead. Out of a sense of shared history with those displaced, the Jewish NGO Shalom Alaikum was born. Golda, the founder, was coming back from vacation when the crisis hit home; she felt compelled to act, and had heard of people assisting the refugees but didn’t know of anyone personally. So she decided to post a request through a status update on Facebook. And she got a response. In October 2015, a group of eight Jewish women from the Vienna community established the NGO. Since then, Shalom Alaikum has provided all sorts of assistance – from translation services to psychological help and medical services – to a hundred refugees coming from Syria, Iraq, Afghanistan and Nigeria. The work is intensely personal: Sonia – a member of the board– receives hourly updates on the status of the families under assistance. Someone is feeling better now, after his cold. Today they granted asylum to so and so. It’s a girl’s birthday now. Yesterday, a baby was born. During the past days, however, Sonia seemed particularly expectant, checking the weather compulsively on her phone and getting ready for the NGO’S first public event: a picnic in the mythic Prater, the most well known park in Vienna. On Sunday, Sonia came to pick me up in car packed with water bottles, orange juices, blankets, ice and tissues. We looked for a parking space, unloaded the stuff and set out across the grass. Everyone was expectant. Balls, Frisbees, and blankets sprayed around. And suddenly, there they were. A big group, approaching us: kids, men and women with their heads covered. They set up across the lawn. I sat with a family of ten or more refugees from Afghanistan: a woman with green eyes was sitting in front of a pot of rice with noodles and meat. Her mother was sitting with beside her, with her legs crossed, she looked a-hundred-years-old: her face –like those of Canneti’s refugees– a testament to the trauma that they had gone through. 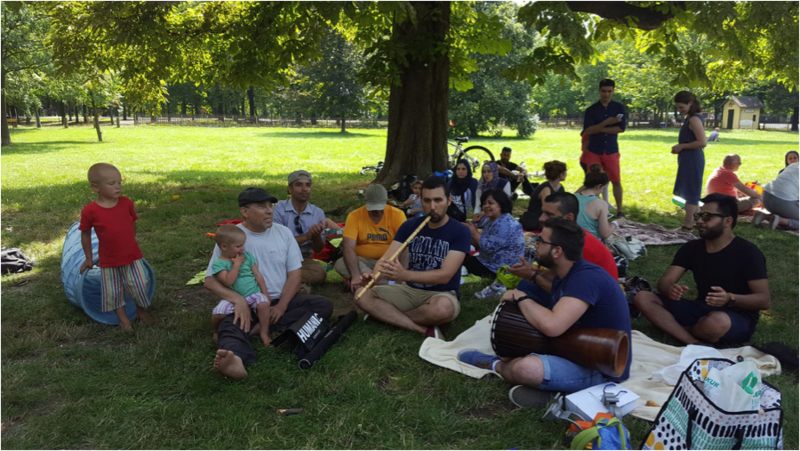 While most kids played around with the balls and the Frisbees the men took out their music instruments – a flute and a drum- and all of a sudden there was a circle of Syrian men and women singing along to a tune from back home. At that moment I felt the power of this appropriation of public space: they are singing in the Prater, and it’s ok. The park can contain multitudes. As we sat and enjoyed the food, Golda told me that many of the refugees came from societies where antisemitism is normal. Most of them, however, had never actually met a Jew in their lives. By acting as a bridge to Austrian society, Shalom Alaikum seeks to establish this type of cross-cultural dialogue. And, it occurs to me that what this group of women is trying to do is in conformance with both Islamic and Judaic culture. They are promoting a value, that unfortunately, seems to be lacking in a Europe of far-right nationalism, growing anti-semitism and rampant Islamophobia: the value of hospitality –what the Jewish philosopher Levinas, himself a refugee, called “The love for the Other”. A couple of days after the picnic I am sitting with Sonia drinking coffee and reflecting on an experience. All of a sudden she looks down at her cellular phone and her face lights up. She shows me a picture of a couple hugging each other, holding a baby. I recognize him as the one playing the drums in the Prater. “His wife just arrived with their thirteenth-month-old daughter. He hadn’t seen her for eleven months!” she tells me. “Look at her face!” Sonia yells excitedly, as I hand the phone back, “Isn’t she cute?” I am taken back by the reaction, one would think she was showing me a picture of her own daughter.